The outside layer of skin is called _____. The human body has _____ lungs. What gives skin and hair its pigment? Name the pipe that shifts food from your throat down to your stomach. The bones that make up your spine are called _____. What controls how much light passes through the pupil? What is the anatomical name for 'windpipe'? You aced it! You’re a biological genius! You must’ve had straight A’s in high school, and you probably know everything there is to know about the human body. If things like genetics get you excited, SHARE your amazing score with the world! You got 9/10 correctly. Only 4% of the population can score this high. You must’ve been the teachers’ favorite student in high school. You were organized; you took good notes and used them; and you always turned in neat papers. Are we spot-on? Let us know in the comments, and SHARE your amazing score with everyone you know. Average score!! Give this high school biology test another whirl... BUT give it your best shot this time. 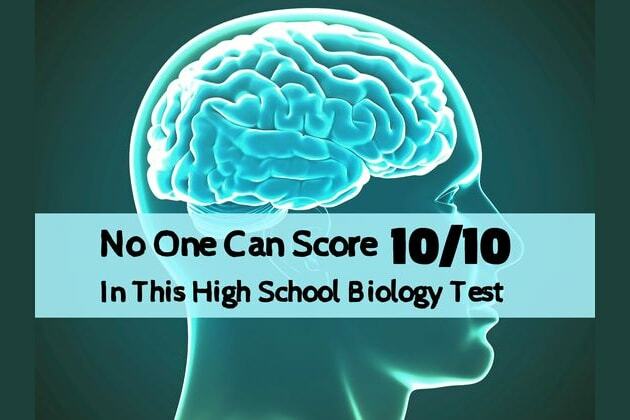 You totally failed this high school biology test! You were a horrible student in high school, but also the coolest one... Everyone secretly wanted to be like YOU. Are we spot on? Let us know in the comments! We gave this basic biology test to 100 high school students. 85% couldn't get more than 5/10 correctly, and only 4 got a perfect score. Think you can score better than the average? Give this one a go! !